Sant’ Agata Bolognese is but a speck on the map. In fact, Lamborghini has done a wonderful job of hiding its factory in plain sight. After just over an hour of driving around, yes we were lost, I happened to notice a flat two-story building on the other side of a farmer’s field. Out back of the building were large white, yellow, black, orange and green objects. Bingo! Gallardos wrapped in plastic. The building itself is a testament to the company’s founder. The original factory with its vintage script signage still exists at one end of the complex. 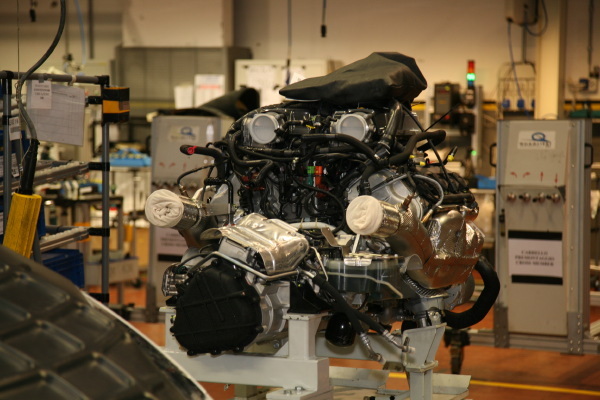 A new state of the art assembly facility has been constructed around it. Waiting for our tour guide, I happened to notice the outdoor cigarette ashtrays set up around the lobby. Each unit is fashioned with a gear shift lever and knob sticking out the top of it. The passion for cars seeps from the building. 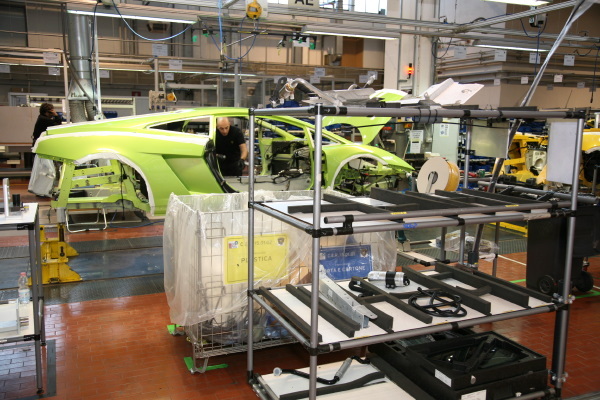 Our first stop was the “U”-shaped assembly line where the Lamborghini Gallardo is brought to life. 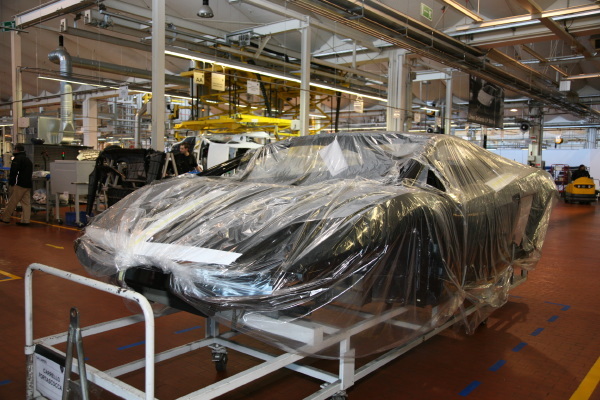 The plastic-covered aluminum Gallardo shells are brought to the assembly line from a separate fabrication plant. Workers assemble the cars by hand. The initial stage involves removing the doors and rear engine cover. Then, skilled technicians lay tape and plastic shields onto the body to protect the painted surfaces as the larger pieces are bolted on. The prepped platform is then picked up by an overhead cradle and flipped over to a jig that rides along on a dual track conveyor belt. The line moves forward every hour between the work stations, as employees clad in Lamborghini-logoed designer casual wear whirl in and around the exotic coupes and convertibles. 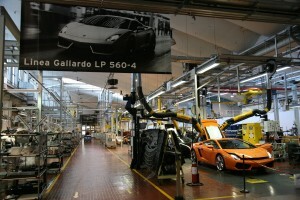 All versions of the Gallardo are made on this line. Eventually the body in white begins to transform into the seductive sports car we recognize. 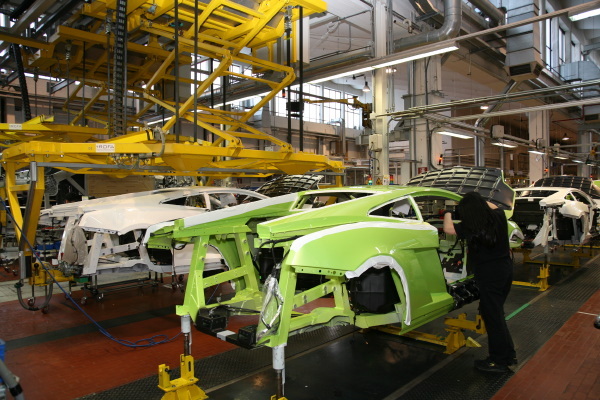 Once completed, each Gallardo is filled with fluids and tested at the end of the line prior to being driven off the line and out of the assembly building. With five or six produced daily, each Gallardo spends three days on the line. Hardly the mass production Henry Ford dreamed of, but certainly in keeping with the exclusive nature of the brand and model. After watching the assembly process and final testing of an orange Gallardo, we went to the corporate coffee shop for a jolt of caffeine. Passion on an assembly line is difficult to discern, after all it is a mechanical process. However, watching the care and pride that goes into preparing a coffee drove things home. A Lamborghini is no ordinary inanimate object, it is a work of rolling art that has the blood and sweat of the assembly team in its DNA.